I expected that the size of our reptile collection would shrink through attrition, but I expected it to be a result of snakes succumbing to old age (some of the garter snakes are starting to get up there, for example). I did not expect to find the male Cape Gopher Snake (Pituophis catenifer vertebralis) dead in his cage this morning, from unknown causes. 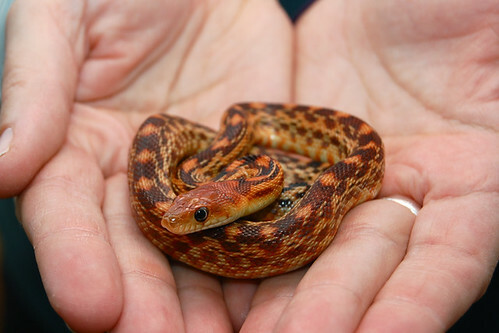 He was the youngest snake in our collection and our most recent acquisition; we acquired him in November 2007 (the picture above dates from that time). This isn’t just an unexpected shock; it’s annoying. Pituophis are so robust, you don’t expect anything like this to happen: we’ve kept four pairs of them and raised an additional five babies, and this is the first loss we’ve had of this genus, ever. Meanwhile, George is still not dead (previously).